ZIF Sockets make it easy to add and remove IC's from boards. Perfect for use with IC's that require frequent changing. Comes with a armature that can be used to lock and unlock the IC to the base. As the name implies, your chip will just drop into the socket and a press of the lever will lock it into place. Release and repeat. 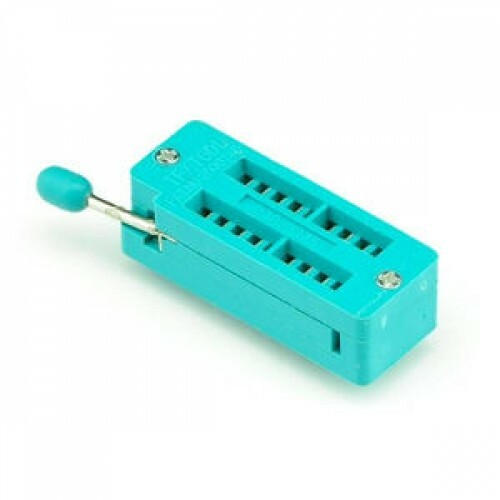 This is a high-quality, easy to use 16 pin ZIF socket that is 0.3" wide. Makes for easy connecting or programming to DIP ICs. Uses high conductivity terminals create solid connections. Can also be used for smaller pin packages.